These summer beverage recipes are so flavorful and refreshing! Adding herbs, fruit and cucumbers is a great way to naturally flavor your water, without weird dyes, fake sugars and artificial ingredients. Cucumbers are rich in anti-oxidants and this blend with mint is great for digestion. 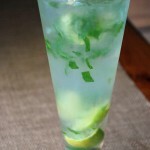 I also wanted to share my husband’s awesome mojito recipe. He makes the best cocktails and this one is fabulous without the need for simple syrup. The sweetness comes from liquid stevia to taste and it doesn’t require much. This is the best (waistline-friendly) cocktail on a hot, summer day! Combine all ingredients in a large, container (half recipe, if needed) and let flavors mingle for several hours or overnight before drinking. Muddle mint, lime and stevia (or agave) together in a tall glass. Fill glass with ice and add rum. Pour club soda to fill to the top of the glass. What are your favorite summer beverage recipes? Share in the comments below. I need to make that water-looks so refreshing! 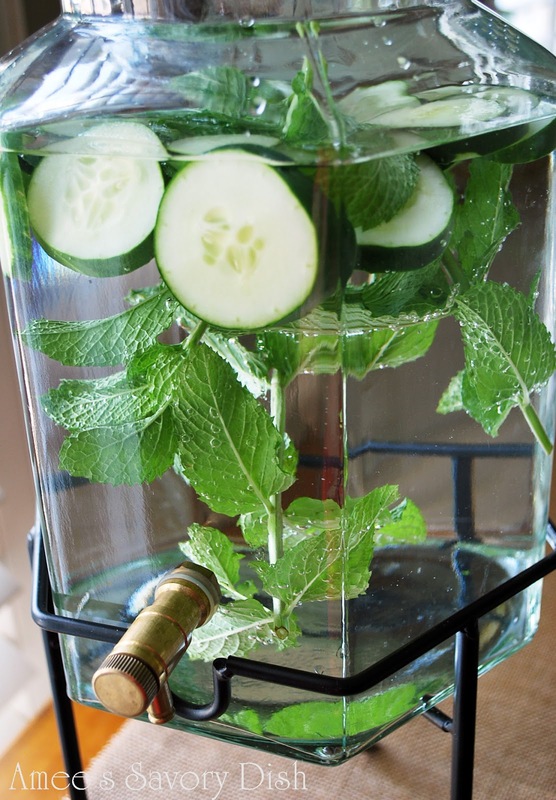 Oooohhh, the cucumber mint water looks so delicious! I’ve made flavored waters before, but not that combination. I’ll be sure to try. And, I think I’ll have to find such a beautiful water dispenser. I used the cucumber mint water recipe today for a bridal brunch. The water was so refreshing. Thank you for sharing the recipe. Thank you for sharing this feedback Janet! I’m so glad that you enjoyed the recipe!